Backroom Bluegrass Band - Meet the Band ! 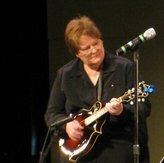 At the Kentucky Mountain Arts Center, Prestonsburg, KY.
Pat “I never met an instrument I didn’t like” Soister principally plays mandolin and guitar with the band. On that fateful day in October 2000, she joined a jam session in the backroom of Hopper Hall and the rest, as they say, is history. Pat is also a member of an oldies rock n roll band, Cane Ridge Revival, where she plays guitar, mandolin, drums and anything else they hand her. Pat grew up in northern Kentucky. She moved to the Lexington area to attend Midway College and the University of Kentucky where she earned degrees in education. Pat works as an educator at Central Baptist Hospital to support her music habit. Not only a gifted musician, Pat's contagious enthusiasm serves as a "spark plug" for the rest of the band! Jane grew up in St. Albans, West Virginia before coming to Lexington to attend the University of Kentucky, where she received a degree in Music Education majoring in organ and harpsichord. She recently received a Master of Music degree from UK with an emphasis in Sacred Music and a masters degree in church music from Lexington Theological Seminary. Jane is Director of Student Affairs for UK's College of Fine Arts and organist for Crestwood Christian Church (Disciples of Christ). In 1999, she decided she would like to learn to play bass so she could participate in bluegrass jam sessions at Firehouse Station 18 with her husband Bill. That year he gave her "Homer" the bass as a Christmas present. Jane's other hobbies include antique automobile touring and growing orchids. Walt is the lead singer and guitarist for BBB. He was born and spent his early years in the Rio Grande Valley of South Texas. At six years old his family moved to Cary, North Carolina, where he was reared. He began singing professionally at 17, performing folk music for church and civic groups throughout Central North Carolina. He continued performing during college, playing in restaurants and clubs, and on radio and television shows in the Carolinas, Tennessee, Virginia, and Kentucky. In 1965 Johnson toured the Kentucky State Resort Parks, entertaining and designing locations for live entertainment. For the past 30 years, the folk singer has performed for private institutions, colleges, civic clubs, churches and youth groups. "I was born in the United States, but I grew up in Texas" states the Louisville, Kentucky-born Dobro player for the band. "My favorite early memories were of my parents and me arriving at my grandparents' farms near Mammoth Cave after the long journey from Dallas. If it wasn't too late in the evening, my aunts and uncles would be playing their guitars, mandolins and the piano in the parlor. Sometimes my mother's cousin, Jake Kessinger, would be there playing the Dobro. I guess that's where the seed was planted." Dan was a long-time solo performer playing guitar and singing the songs of Texas songwriters like Kris Kristofferson, Guy Clark and John Denver and he sang and played in a Dallas area folk trio named "Warehouse". "That's where we practiced, in a warehouse." While completing a Bachelor of Arts degree in Humanities at Morehead State University, Dan worked with the "Sittin' In" bluegrass band. After graduating, Dan returned to his home town of Irving, Texas and he and his brother formed a band named "Southern Bread" with brother Bill on mandolin, Mike Jump on guitar and Bill Schrader on bass. They toured the southwestern bluegrass circuit extensively. In 1986 Dan moved to the Lexington area and was pretty quiet until he became a member of Crestwood Christian Church where he played in the fifties and sixties revival band Cane Ridge Revival. "Singing and playing rock 'n roll was quite a stretch for me; I'm a ballad singer at heart." After a three year gig with Cane Ridge Revival, Dan resigned from that band to focus on the BBB and polish up the solo work. "I'd like to do a solo CD with hymns and sacred songs. I 'm thankful to have had the opportunity to play with all the musicians that I've worked with over the years; they are the ones that have made me whatever it is that I am." Bill plays banjo with the band and also plays 6 and 12 string guitar and dulcimer. He's a self-employed computer, network and recording/audio technician. He is also a locomotive engineer at the Big South Fork Scenic Railway in Stearns, KY and in December 2004 was at the throttle of steam locomotive SP 745 when she returned to the mainline for the first time in 48 years and in late March - early May 2005 piloted her on a 1000 mile 25 city tour pulling the Louisiana Bicentennial History Train. Click here for Bill's journal that he kept on the trip and for excerpts from that journal that were published in the October 2005 edition of "Trains Magazine". Bill and Jane are also longtime antique auto collectors and tourers. Bill was born in Morgantown, WV, lived briefly in Catonsville, MD, and at 6 moved to and grew up in Brandenburg, KY. He attended the University of Kentucky where he met his future wife. After moving pipe organs, pianos, harpsichords and the upright bass for his organist/harpsichordist/pianist/bassist wife, Bill's advice is "never date women who play furniture!!!" He is self-taught in playing guitar and learned to play banjo as a student of Dr. Tim Lake. On December 19, 2006, our dear friend Homer went to be with his savior. While our hearts ache at the loss of such a wonderfully talented, warm, loving Christian brother, we cherish the many gifts he shared with us while we traveled the path together. We can't wait to hear the band he's put together in Heaven! We could fill several books about Homer Ledford documenting his many accomplishments in and contributions to bluegrass music. The book Dulcimer Maker, The Craft of Homer Ledford which was written by R Gerald Alvey and recently rereleased by the University of Kentucky Press is a start. Playing at least 13 different instruments, Homer is probably one of the most versatile and entertaining artists in the genre. 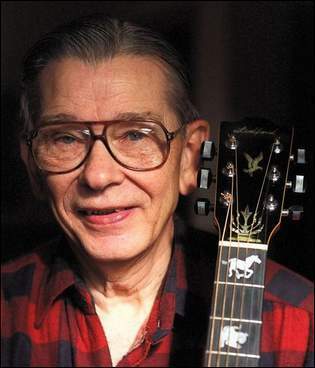 In addition, he has made 6014 dulcimers, 477 banjos, 25 mandolins, 21 guitars, 19 ukeleles, 13 dulcitars, 3 dulcibros, 3 dulcijos, 5 violins, and 2 bowed dulcimers and he was featured recently on page 50 of the May 2003 "Bluegrass Unlimited Magazine". Several of his instruments are in the collection of the Smithsonian, and the famous Homer Ledford and the Cabin Creek Band have been entertaining, including a number of international performances, since 1976. The Backroom Bluegrass Band is truly honored to have had Homer as a friend and member of the band. Dumbo is a 1971 Dodge/Thomas "Mighty Mite" D300 bus. It started life as the activity bus for South Johnston High School in Four Oaks, NC and ended up at T.R.O.S.A. in Durham, NC who put it on the eBay internet auction. It was purchased for the astronomical sum of $300 and was driven without any problems to its new home in Lexington, KY in October of 2001. Since then, it has received a complete restoration including a set of airliner seats, sound system, cruise control, GPS navigation system, and air conditioning. Other improvements include new Thomas Bus interior baggage racks, rear shock absorbers, a Bostrom air-ride driver's seat, and a Nathan P3 locomotive air horn. The 360 cid V8 engine was rebuilt and "improved" by Estes Automotive Racing Engines in Nicholasville, KY and the exterior restoration was performed by Tim Arnold and a group of fellow Thomas Bus employees near Lexington, NC in February and March of 2002. Dumbo got its name from Bill's wife Jane who said it was a name with dual meaning - the bus is a white elephant and it could also refer to the guys in the bus who occasionally use it for chasing trains. It is one of only 600 Thomas "Mighty Mite" buses produced in the early 70's and is believed to be the only one still in service.